The Concurrent Design Facility (CDF) was established at ESTEC in November 1998; on an experimental basis, under the sponsorship and initiative of the General Studies Program (GSP). The idea was to evaluate the use of Concurrent Engineering (CE) to create an integrated design environment for the assessments of future missions. The first case study was provided by the Central European Satellite for Advance Research (CESAR) mission assessment, performed from January to March 1999, which ESA had undertaken jointly with the Italian Space Agency (ASI) on behalf of the Central European Initiative (CEI). The design facility was named after the study: CesaR (Concurrent Engineering Set-up for Advanced Results). In ESA, the concurrent engineering method had already been partially applied in two mission assessment studies: Euromoon and Venus Sample Return. These examples were not concerned with the suitability of the method itself, being focussed more on the actual mission under definition rather than a permanent re-usable infrastructure. The means to create the facility on an experimental basis was simply to organise the existing tools and human resources already employed for space-mission assessment studies in a more effective (i.e. concurrent) way. The accommodation comprised a design room, plus a meeting room and project support office space. Due to the experimental nature of the exercise, existing equipment was used to build up the facility and the infrastructure was based on products already available within the office automation domain. This enabled the training time normally required, to be utilised instead to concentrate on the methodology. The CESAR study was considered a success and allowed for an operational facility to be created, available to all ESA programmes. The only building available to house the facility was in temporary barracks. However, these were soon converted into a working CDF and it allowed for a more ergonomic layout and greater interaction of the participants. As well as hosting many pre-phase A assessment studies, this room was more amenable to different team layouts, allowing for reviews of industrial studies, Tiger Team reviews, videoconferences and presentations as well as many ad-hoc uses. After more than 70 assessment studies and 12 industrial reviews many people had fond memories of the old facility, but of course the barracks were not permanent and it was always the intention to move. In December 2007 the move to the purpose built new CDF took place. The CDF has become a reference point for other European partners in the application of this new approach and methodology to space mission design. 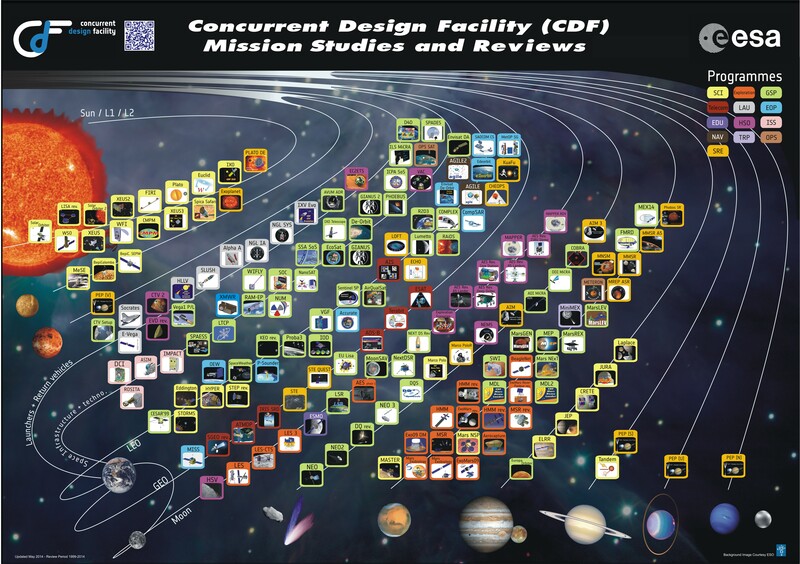 Both industry and national space agencies are using the CDF as a guide to creating their own facilities and processes. In support of this, we provide advice and share our experiences with the goal of improving the design process of future space projects.